What is another word for jeremiad? 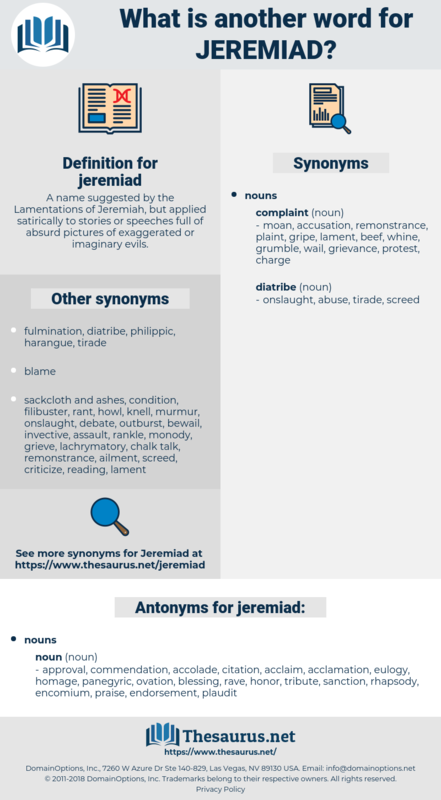 A name suggested by the Lamentations of Jeremiah, but applied satirically to stories or speeches full of absurd pictures of exaggerated or imaginary evils. approval, commendation, accolade, citation, acclaim, acclamation, eulogy, homage, panegyric, ovation, blessing, rave, honor, tribute, sanction, rhapsody, encomium, praise, endorsement, plaudit.